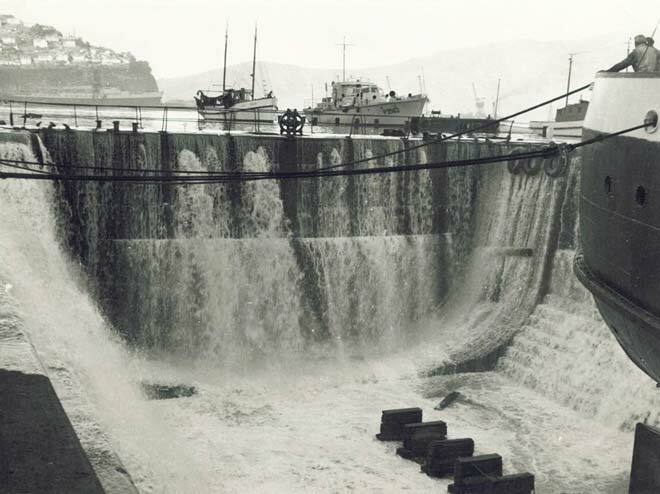 Water poured into the dry dock at Lyttelton, in the South Island, during several of the surges from the Chile tsunami in May 1960. In 1960 I was a ship's engineer on the Shaw Savill ship SS Persic. We were anchored in Lyttelton Harbour in the South Island when we received a message that the Chile earthquake had generated a tidal wave (now called a tsunami) that was racing across the Pacific Ocean and would hit the N.Z. coast. I had orders from the captain to keep up a ready head of steam, in case we had to evacuate the harbour. On the day the tsunami arrived I went up on deck to view the event. Around the high ground of Lyttelton Harbour were a crowd of sight seers, with full expectations of seeing my ship disappear under the waves. The wave struck and raised my ship 14 feet and flooded the pier. When the wave retreated it took many small sailing craft with it. The next day my ship had orders to proceed to Napier on the North Island to load Red Cross supplies, which we had to transport to Chile as aid from New Zealand. We unloaded the supplies in Peru. Now 53 years later I remember as if it was yesterday.